Spring Creek had the good fortune to appear in 1992, just before Robert Redford made the connection between spirituality and fly fishing a foregone conclusion. It may have been the last book of essays to be written in that blessed time before fly fishing became the subject of the story—or the resume, or Facebook profile—and existed mainly as part of some separate narrative in most people’s lives. So it is fascinating to re-read Spring Creek after twenty years. The author’s clarity of expression is refreshing now, just as 20 years ago it was helpful in collecting our thought about the more intricate and interesting parts of the sport. The various chapters—”Mornings,” “The Big Fly Comes,” “Time and the Headwaters,” “At the Second Bend Pool” and others—define the author as innocent but not naive, and immensely approachable. 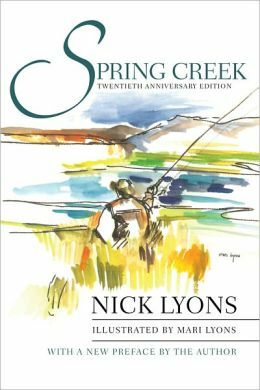 By choosing a single spring creek as the setting for what he learns about fishing and about himself, Lyons managed to make a place for each of us, especially the non-experts and the oddballs and the ones who can never quite figure out why they have to follow any rules in the first place. Lyons’s grounding in tradition and literary history gives him perfect authority to use it or leave it behind. Written prior to the cultural softening of the mid-section that the 90s brought to fly fishing, Spring Creek is in some ways a book-end, an estimation of the sport was before it suddenly found itself consuming energy in order to maintain the belly rather than to help define what makes each of us, as anglers, different. If you’re finding it for the first time, you’re in for surprisingly satisfying read. And if you need a reminder of the uncountable things that really matter (and don’t matter) in throwing flies at fish, consume it one chapter at a time—only until you’re no long hungry—and don’t hurry through the richness.